"Insightful, yet practical. Geery has created a framework for all leaders to use as they respond to or initiate change in their sphere of influence. Having followed Geery's advice for years, I can affirm the concepts outlined work... and work well." "Any organization that does not intentionally plan for navigating change will fail. Sure, you can read the top ten books on the subject - or you can rely on Geery's skillful story telling and sage advice. Organized in a condensed, informative and entertaining read, Planning for Change offers wisdom in bite sized servings that busy managers can digest, and more importantly, apply." 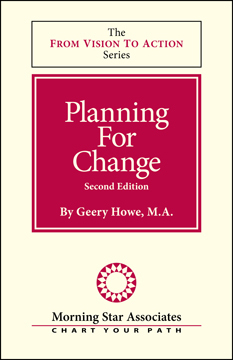 "In Planning For Change Geery Howe creates "word paintings" from his life experiences that skillfully draw the reader into this small book, and, therefore the message. The wisdom and real-life help in these pages speaks to the newly appointed leader, as well as serving validation and reminder for those who have been in that role for some time. This should be required reading for managers and executives before they start down the path to making changes. It could become their beloved dog-eared companion that will provide guidance and reference when it is most needed." Many years ago, as the sun dawned over Organ Pipe National Monument in southern Arizona, my college professor turned to me and a group of fellow students and presented a challenge: "You are to travel from this Visitor's Center to the camp site on the other end of the park in one day. There will be no trails to guide you. I'll be waiting for you at the camp site." We were participating in an off-campus study program on the deserts and natural history of the Southwest. We had hiked, camped, and studied the flora and fauna. Now, for our mid-term exams, we were being tested on our ability to work together as a team by traveling via map and compass through the desert. We loaded our backpacks and moved out. By mid-morning, our line leaders were arguing about our location. We all pulled out maps and began to look for familiar landmarks. After considerable disagreement, we got out our compasses and attempted to orient the maps. Upon lining up true north with the correct markings on the map, we realized we were completely lost. One member of the group argued that since we had learned our compass skills in Indiana, we should modify them for Arizona. His argument was that the compass reading should be adjusted since we were at a different geographical location. This seemed reasonable. So, after adjusting the compasses for potential changes in longitude and latitude, we all agreed on our location and set out once again. It was a long march. The sun moved across the sky as we hiked, and, as it slowly set, we had not arrived at the designated campsite. Finally, we came to a gravel road. Setting up camp, the group was despondent and upset. Not only were we lost, but we had failed our mid-term exam. My hiking partner and I decided to walk along the road to see where it led. After 20 minutes, we found a sign that read: "Visitors Center - 1 mile." We had hiked all day in a 15-mile circle, arriving one mile from where we started! The next day we tried again -- this time with better results -- and arrived at the designated location for a hot and welcomed dinner. After the meal, our professor gathered us together and reviewed what happened. "Common sense needs to guide your actions," he admonished. "The Visitors Center is in the east and this campsite is in the west. All you had to do was follow the sun across the sky! A good hiker never argues with his compass." Each of us learned an important lesson that day. During times of change, many of us feel lost or unsure. We may struggle at times with issues of self-confidence. Challenges or poor communication in the workplace can wear us down. We forget that true change requires us to step outside of our "comfort zone" and into our "challenge zone." When we try to impose control and order, we often sacrifice trust, clarity, and courage. We forget that the map can only describe the territory -- and only certain aspects of it at best. It is the compass that sets the course. We need to return to the compass, and to common sense. What is Our Moment of Truth?